Day #14 – Sunday Night Mish-Mash | Have kids, they said. It'll be fun, they said. As I mentioned on Day #12, I was away yesterday at a fun-filled and relaxing wedding. While my dear mother stayed here and looked after Princess and BoyChild, I expected them to eat takeaways for dinner. In fact, I encouraged it. But no – in order to keep consistent with this No-Takeaway Challenge, they cooked an awesome meal for the kids. Well done, Grandma! And, the food at the wedding was exceptional and homely – the wedding was in a marquee on a farm and the food was home cooked and catered not by fancy caterers but by family and friends. There is a lot to be said for a classic Kiwi wedding with salads, roast chicken and lamb, ham on the bone and potatoes from the garden, followed up by Pavlova and cheesecake for desert. Oh my, I’m drooling once more. Superb. Utterly superb. But I digress! I got home mid-afternoon and I am completely shattered. I even snuck in a cheeky nap on the couch this afternoon – in fact, I may have stopped mid-sentence and just suddenly fallen asleep. That’ll learn me for staying out till 11pm on a Saturday night *gasp*. Sorry, digressing once more. I think I’ll sleep well tonight! My mum is visiting my sister and Mr T is at work, so dinner tonight was just the kids, Grandad and myself. And, to be honest, I didn’t feel like much at all. And, to be perfectly honest, the idea of takeaways was discussed. At length. But, I reluctantly dragged my feet to the freezer to see what I could whip up. And thus you have, the Sunday Night Mish-Mash. 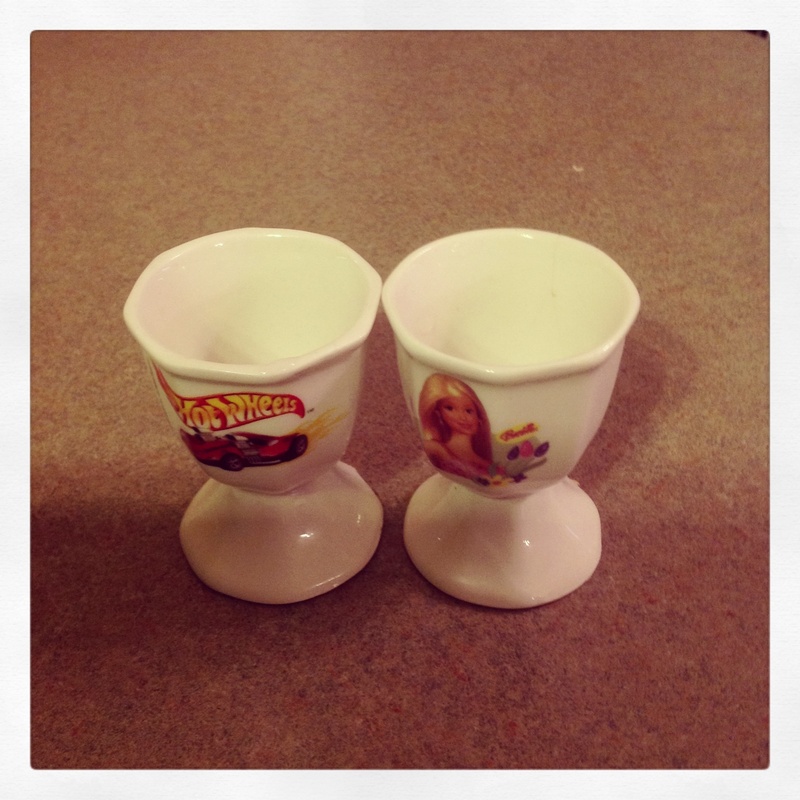 For Princess and BoyChild – “Egg Soldiers”. That is, a soft boiled egg with toast cut into strips (the “soldiers”) for dipping. And, an entire carrot each. Because .. well, because. For BabyGirl – Cooked egg yolk, toast and watermelon. All schmooshed together and flung from here to eternity. And, for Grandad and myself – Steak, eggs and potato rosti. Steak was simply seared in a pan until medium-well done. Eggs were fried and deliciously gooey. Peel the potato and then grate into a bowl. Try to get as much liquid out as possible – the best way to do this is to use paper towels but we didn’t have any so I had to rely on squeezing it in handfuls while the liquid seeped away. Once the potato is relatively dry, mix in the egg. Fry in batches until cooked on both sides. These make lovely little fritters which I adore. Well, the kids loved their meals of course. The potato rosti was *ok*. I’m not going to call it a win because, tonight, they didn’t really hold in the pan so it was more “fried, grated potato” than “fried little fritters”. But, I shrug because I still liked them. Grandad says they were very nice which is fine praise from him! On the plus side, Princess is getting very good at peeling potatoes, she loves it. 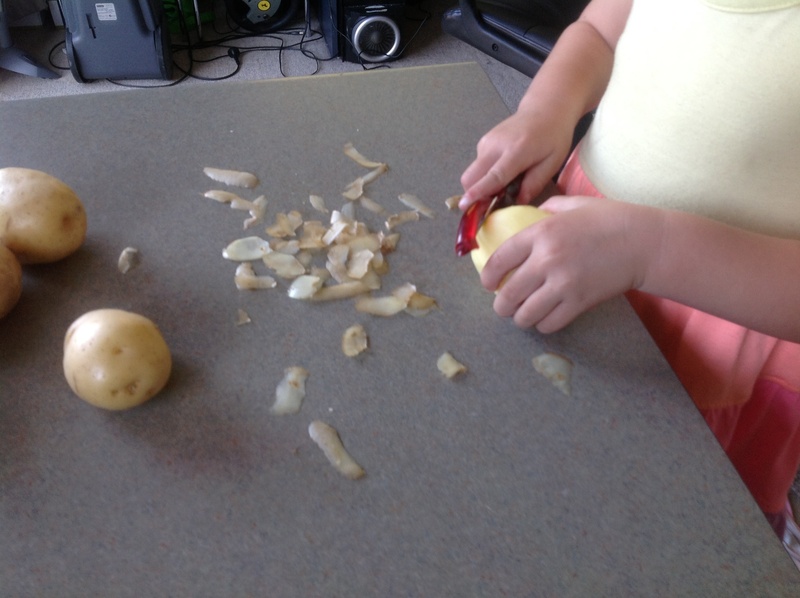 And, she helped to grate the potato as well, on her mini grater. She watched with amazement as I drained the “water” from the potatoes and exclaimed – “Is that yellow potato water? I’ve never seen yellow water! I don’t think I want to drink YELLOW WATER, MUM!”. Bless.